For a long time, content has been king in the area of eLearning. Few RTOs and other learning organisations have the resources to author relevant eLearning content while ensuring it’s both visually pleasing to the learner and enjoyable to use. But whether you're a visual designer or not, by paying attention to a few key principles you’ll be able to create engaging and beautiful content that is more than a cut above the rest. 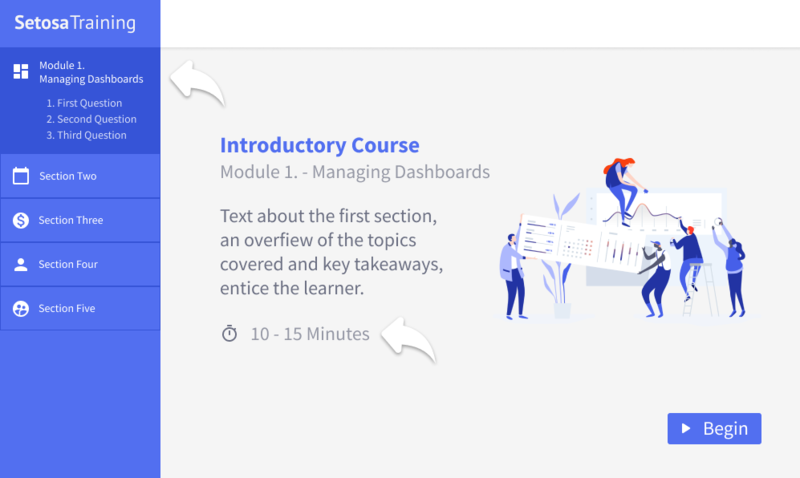 For lengthier assessments or eLearning courses, clear navigation becomes increasingly important, especially if it’s likely that a learner won't usually complete the course in one sitting. 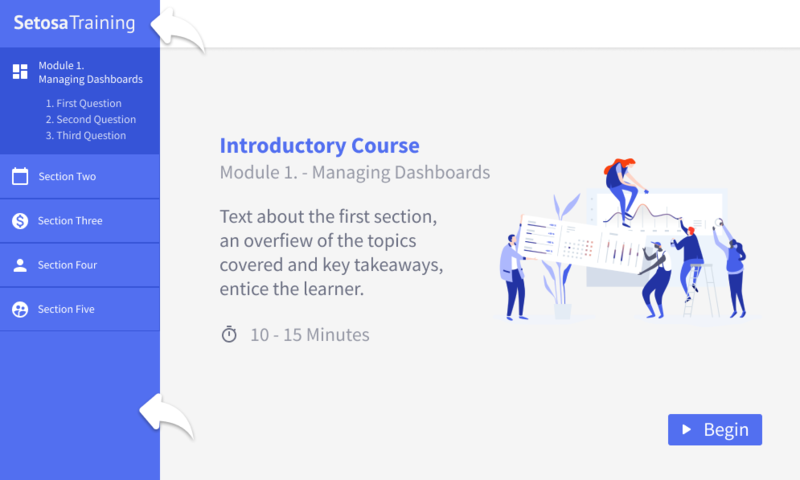 For some short and linear courses, navigation can be as simple as a ‘Next’ button. 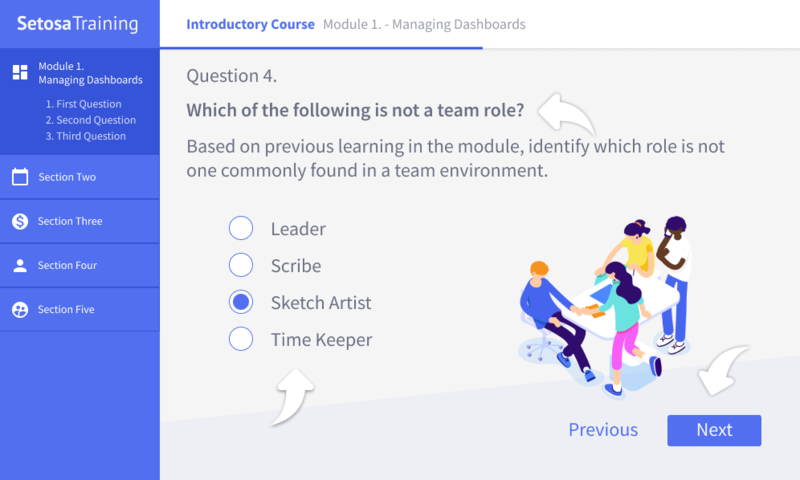 For more complicated course types with skippable questions and flexible orders, learners must be able to easily navigate between sections and questions. If learners are able to complete the course in a flexible time period, they may wish to pause or leave the course to resume it at a later time. It’s important that when a learner returns to a course they have a clear understanding of where exactly they left off. While not always possible when authoring for smaller devices and screens, it’s important to strive for a balance between the efficient use of space and a visually pleasing layout in which each distinctive element in your template is given sufficient breathing room around it. Attention to the proximity of each element will increase overall usability for learners and will help to ensure they aren't overwhelmed by cluttered content. Elements such as progress bars and time estimates can assist learners in better understanding their overall progress through the material, as well as giving a solid indicator of what they are delving into. The below example demonstrates a way to reinforce a sense of progression without interfering with the design of the rest of the content. Breaking long eLearning courses up into modules or sections can also help learners work towards progressive break points to resume easily at a later time. Your RTO’s logo is its most important call sign for students and is what they will use to recognise your RTO in any eLearning materials you create. In addition to your RTO logo, plan and create a distinct colour palette to apply to the various elements throughout your template. This palette usually derives colours from your logo but may vary depending on how they’re implemented. No one wants to feel like they're making their way through a course from the early noughties. Small micro interactions such as hover effects are an absolute necessity for any modern-day web-based content. These effects give small yet important bits of visual feedback to the learner as they perform certain actions such as clicking a button or hovering over an answer. Not only does this reassure the learner that their actions are being received, but it also makes the normally mundane task of clicking much more enjoyable. If you’ve been tasked with creating the eLearning content for your RTO, there’s a good chance you’ll be winging it when it comes to how it looks. The option of using an existing template can be a wise move for many authors in this position—but when a more tailored approach is required, consider these points and you’ll be on your way to making the best-looking eLearning in town. Check out the latest updates in the world of eLearning.